As a kid, I spent countless summer days building theme parks while the scorching, yet magically humid Florida sun (or equally common thunderstorms) kept me inside. I founded dozens of theme parks that were doomed from the start thanks to my eleven-year-old business management skills and odd habit of putting restrooms in hard to access areas, just to see how far I could get the pixely park guests to walk before they rage quit in their pants. Over the weekend, game developer Sebastian Mayer and designer Garret Randell posted a screenshot to Reddit of their upcoming, yet-to-be-named, theme park simulator. The post exploded into one of the most highly-trafficked posts on the r/indiegaming subreddit in recent memory. To put it in perspective, the second most popular post for the week has less than half of the upvotes that Mayer’s post currently has, and it is currently the most popular post of the month. As of this writing it is the ninth most popular post, this year. Clearly people are craving a new, and hopefully great, theme park simulator. In his development blog in the TIGForums, Mayer revealed his prototype in early April which he had been working on since late March. He originally constructed the rollercoaster simulation “just to see how difficult it would be to implement,” and as he developed it he realized how much fun he was having and decided to run with it. Mayer promises that his coaster-building system will be “less restricted than in Rollercoaster Tycoon,” and he does in fact plan to allow coasters to run off of unfinished tracks. “I feel like a big challenge will be to keep enough of [Rollercoaster Tycoon’s] elements, yet add enough of my own stuff to set myself apart from [RCT] while maintaining that ‘theme park feeling’ it had,” Mayer said. 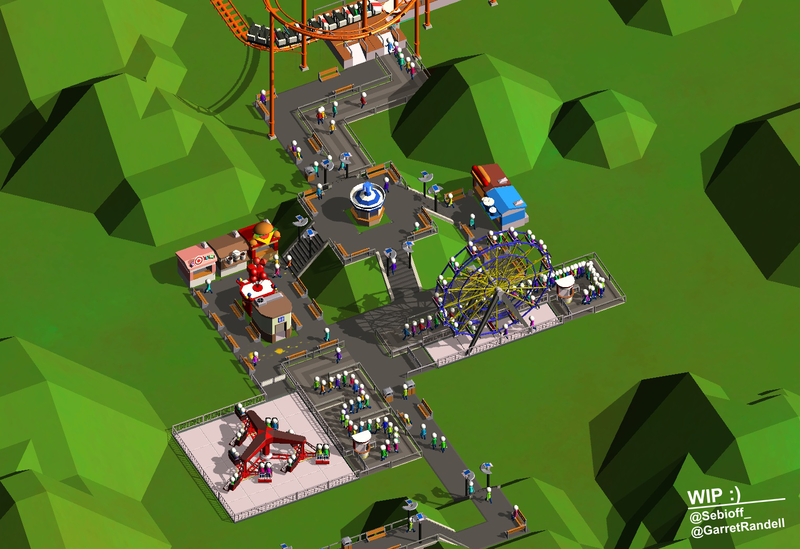 Originally, Mayer was going to utilize voxel-based terrain, but he wanted something “that looks a bit nicer than Minecraft,” so he settled on a system similar to the one used within Rollercoaster Tycoon. Currently Mayer is having some difficulty choosing a name for the game. So if you have any ideas, give him a shout on Twitter.